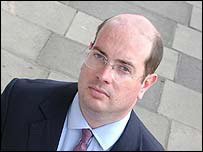 BBC reporter Andrew Gilligan has resigned in the wake of the criticism directed at him in the Hutton report. Mr Gilligan conceded some of his story was wrong, and apologised for it. He said his departure was at his own initiative, but described the BBC collectively as the victim of a "grave injustice". Earlier departing BBC director general Greg Dyke said he was shocked by the findings of the Hutton Inquiry and did not accept all of the report. In a statement Mr Gilligan, 35, admitted mistakes but defended the bulk of his story. He said: "If Lord Hutton had fairly considered the evidence he heard, he would have concluded that most of my story was right." He said the BBC's punishment was "far out of proportion to its or my mistakes, which were honest ones". This report casts a chill over all journalism, not just the BBC's. Mr Gilligan said: "This report casts a chill over all journalism, not just the BBC's. "It seeks to hold reporters, with all the difficulties they face, to a standard that it does not appear to demand of, for instance, government dossiers." Downing Street said it had "nothing to say" on Mr Gilligan's departure. Former Downing Street communcations chief Alastair Campbell also declined to comment when told about the news during the opening night of his "one man show" in South Shields. But Cabinet office minister Douglas Alexander said Mr Gilligan's resignation "was probably inevitable". Speaking on Any Questions on Radio 4, he said: "It's now important that the BBC be given the opportunity to... rectify the difficulties that were identified by the judge's report." John Fray, of the National Union of Journalists, said it was Mr Gilligan's decision to resign. "He does that under no pressure from the BBC. There's never been talk of 'disciplinary' from the BBC," he told BBC News 24. Martin Bell, former MP and BBC correspondent, said Mr Gilligan left with honour and dignity, and the government would struggle to draw a line under the issue. "There's a groundswell of support for the BBC and its position, the repudiation of Hutton is going to make it really difficult for the government to move on as if nothing has happened," he said. Earlier Mark Byford, the acting director general, said the corporation recognised that it had made errors. He said his duty was to bring "calmness, clarity, leadership" to the organisation. "It has been a very, very difficult week - that's an under-statement," Mr Byford told BBC Radio 4's PM programme. "It recognises that it has lost - quite extraordinary for any organisation - both its chairman and chief executive, but ... it must move forward ... there have been mistakes, it's a learning organisation ... and will be stronger from it." Mr Byford is leading an internal inquiry into what went wrong and the steps needed to ensure it does not happen again. BBC director of news Richard Sambrook sent an e-mail to all staff saying he will be working with Mr Byford, senior editors and news managers to look at ways to rebuild trust in the corporation. Earlier Mr Dyke told BBC Radio 4's Today programme it was perfectly fair for people to "draw the conclusion that I don't accept all of the report". "Our legal team were all very surprised by the nature of the report." Mr Dyke suggested the implications for journalism coming from the report were a matter of grave concern for the media. He said he had had to offer his resignation after the report but had not wanted to go. Speaking outside his home in Twickenham, south-west London, he said: "The governors were in an incredibly difficult position. Hutton was very critical of the BBC - so critical that the chairman had decided to resign and I too felt I had to resign. "They decided I did not have their full support." Tony Blair is under pressure to make a statement on the intelligence he presented to Parliament on Iraq's weapons. It comes after the US national security chief admitted for the first time there may have been flaws in the gathering of material about the Iraqi arsenal. Downing Street says it will wait and see whether the Iraq Survey Group turns up evidence of weapons of mass destruction. "Andrew Gilligan's decision took even the BBC by surprise"